Whether it’s global warming or exploiting the tar sands, we are all coming to understand the limitations of linear thinking as it cannot hold and explain complexities and interrelationships. Many paths within shamanism use the medicine wheel or the sacred circle as a way to have a more holistic way of coming to understand the truth of life. 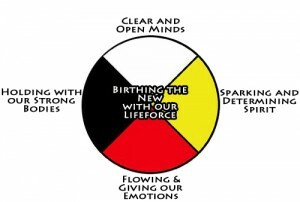 The medicine wheel or sacred circle by its very nature can reveal a much more complex and whole picture. 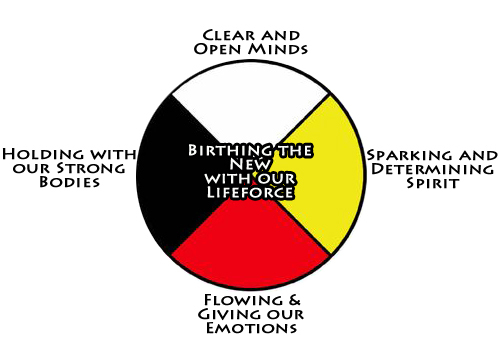 One of the wheel teachings that I use in my work is the Wheel of Human Aspects. do I acknowledge and feed the divine within me? do I find ways to continuously recharge my body? am I allowing my emotions to be present so that they may teach me? is my mind clear clear or is it full of negative inner dialogue? whether I am single or in some sort of partnership, is my sexuality enhancing my life? So where do these teachings come from? For me they come through Harley Swiftdeer from Hyemeyohsts Storm. If you are interested in learning more, check out Hyemeyohsts’ Lightening Bolt. While there are as many differing worldviews as there are groups of people, there are many similarities among indigenous and earth-centred cultures that could be called a shamanic worldview. Notice I said “could” because this is open to debate for those who are interested in definitively defining that worldview. I am not interested at this point because I feel it is important to our survival to be open while critical of any new or old imagining. So all that to say that what follows is “my” amalgamation of the many things I have been taught, read, been exposed to and discovered within myself. I used to think that being successful (having a family, a house and a prestigious job) was the whole point of living. I now know that “success” is about living a life where I pursue my sacred dream – what I came to live/do/accomplish in this lifetime and what the world needs. I used to worry was I moving fast and accomplishing enough? I now know that every moment is a moment on my journey and that there will be moments that I am seemingly doing nothing but exhaling. I used to have a lot of stress over “what I was going to be when I grew up.” Now I know that I have everything within me, that I am what I am and that that is constantly unfolding. I used to blame my parents for an unhappy childhood. I now know that I chose the lessons that I learnt as a result of being in my family. I used to think that what was happening around me close and far had nothing to do with me. I now know that everything is some kind of reflection and learning for me. I used to think that showing myself warts and all was to be avoided at all costs. I now know that revealing all of myself, both my light and my dark, is one of the most powerful gestures I can make. I used to think that my measure as a woman was the thinness of my body and the beauty of my face. I now know that I have a deep connection to the earth and that birthing (not only babies, but ideas, projects, ways of being) is my natural gift. I used to feel alone. I know now that I am connected to all of life from the smallest stone to the biggest sky and that my ancestors stand behind me as my descendants stand before me. I used to keep many thoughts and words inside for fear that others would judge and reject me. I now know that speaking the unspeakable is what many situations demand.